The Directorate General of Migration (DGM) of the Dominican Republic reported that during the month of September 2018, 11,392 Haitians were deported to Haiti or turned back to the Dominican border. 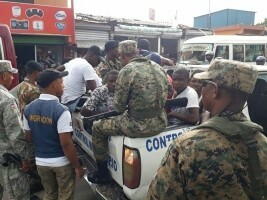 7,102 Haitians were turned back at the border while attempting to enter the Dominican territory illegally and 4,290 Haitians and 61 foreigners (from Colombia, Spain, Italy, Nigeria, Puerto Rico, Russia, Romania and Venezuela) in irregular migration situations, have been deported to their respective countries, after having been checked and recognized as illegal, during migratory control operations throughout the Dominican territory. Lieutenant General Máximo William Muñoz Delgado, Director General of the DGM, said he would continue to strengthen the actions to keep control of foreigners in Dominican territory, in accordance with the General Law on Migration.